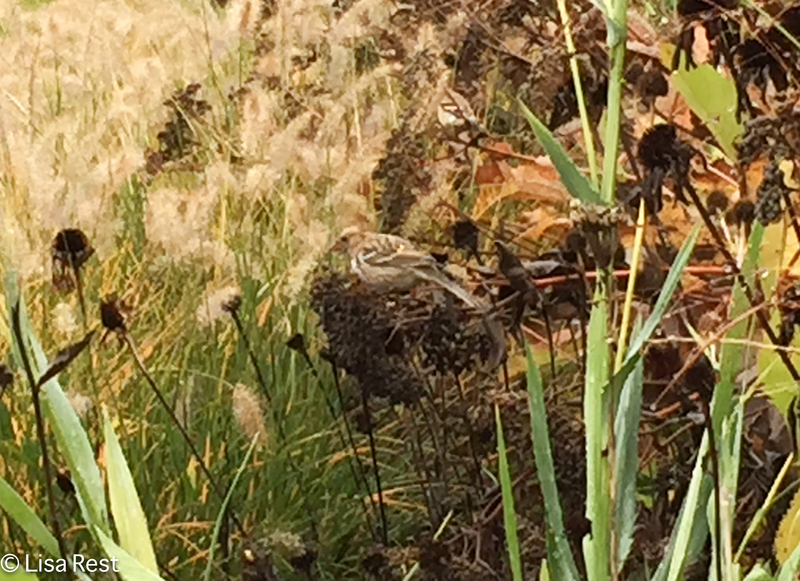 Wednesday afternoon I caught Joan Norek’s post on IBET (Illinois Birders Exchanging Thoughts) in my email about a Harris’s Sparrow at Lurie Garden in Millennium Park. David Johnson had posted the initial sighting but I was so late checking my email I was unaware of it until I saw Joan’s follow-up. Wednesday was the third day in a row I was not carrying the camera with me because of rain and clouds. But I was also going stir crazy, and I had enough peanuts for the crows, so I decided to walk over to Lurie Garden to see if I could find this bird. I have perhaps been within striking distance of seeing a Harris’s Sparrow over the years but have never managed to see one. It was worth checking out and if nothing else it was good to go for a walk. As it turned out it wasn’t raining, just misty/drizzly and yes, overcast. But I had my new cell phone with me and it was probably time to see how much of a picture I could get with it. 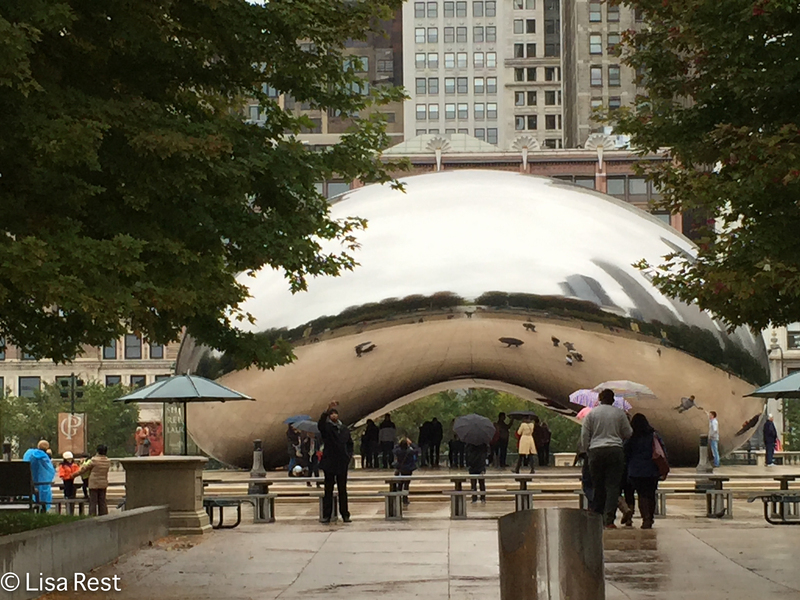 So I took pictures of various things along the way to Lurie Garden at the southeast end of the park. 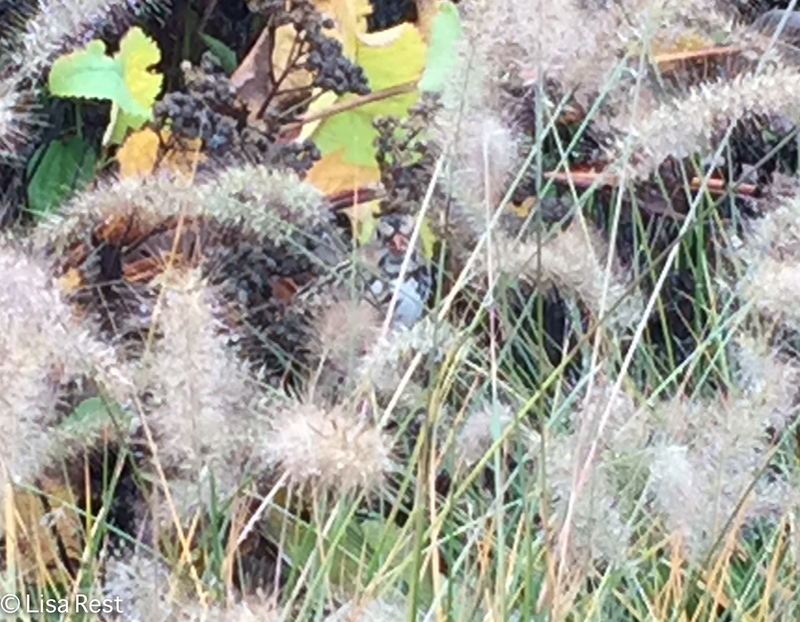 It seemed hopeless to try to get a picture of anything so small as a sparrow. 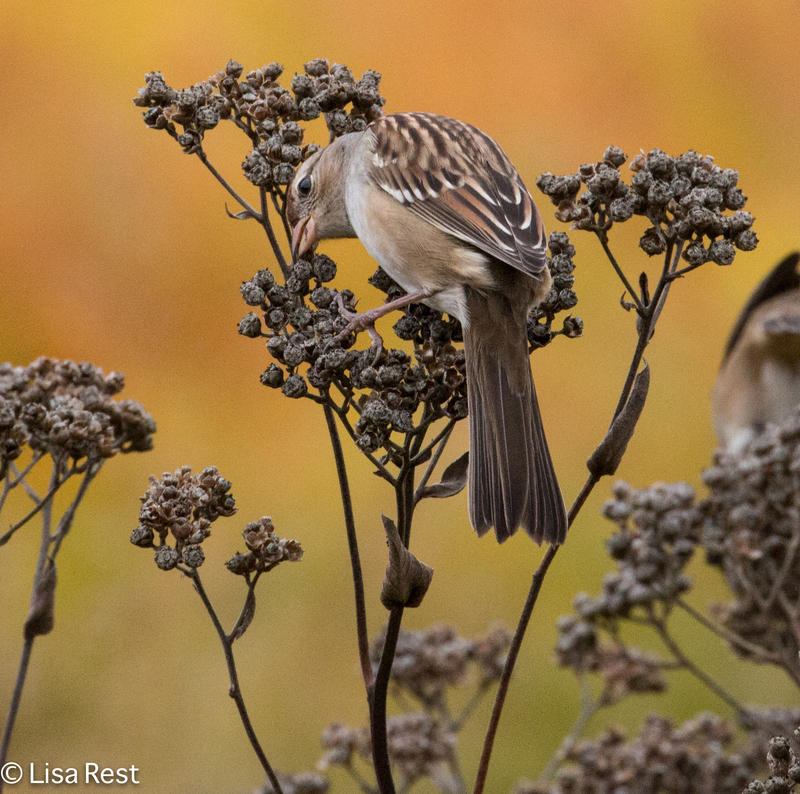 Even a large sparrow, Harris’s being our largest species. I did find the Harris’s feeding in the beds that have all gloriously gone to seed and are left that way to feed the birds over the winter. 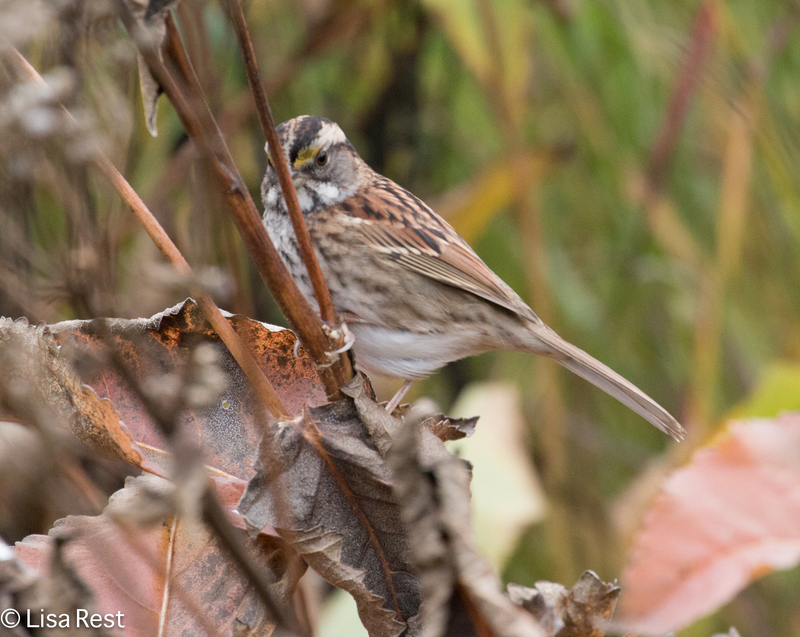 There were also very many White-Throated Sparrows, some White-Crowned Sparrows, and a few Swamp and Lincoln’s Sparrows. But when I found the Harris’s I stayed with him and talked with him and made him promise he would be available for photos the next day when I brought the real camera. Sure enough I returned Thursday with my fall migration getup, which basically now consists of a Canon EOS 70D and a 100-300mm L lens, and that’s only thanks to acquiring an inexpensive but practical camera backpack from amazon. The light was again nonexistent but this is a less critical event in an open space such as Lurie Garden. And even though I could not get pictures of the Harris’s without him being obstructed somewhere by grasses or the wild quinine he was eating, I like the way he blends in and contrasts at the same time (“you are what you eat”!). This also reminds me of something I learned from Bill Hilton Jr. on the Belize trip, about birds (and other creatures) getting their feather colors from the plants they consume. As David Johnson described in a later post, the bird was very tame. But “tame” is not a favorite word of mine when it comes to birds, so I would rather describe the bird, at least when I saw him and took more photographs, as very hungry and nonplussed by my presence. “Go ahead, take all the photos you want, I’m fattening up for my trip to Texas” or wherever he’s going to wind up. 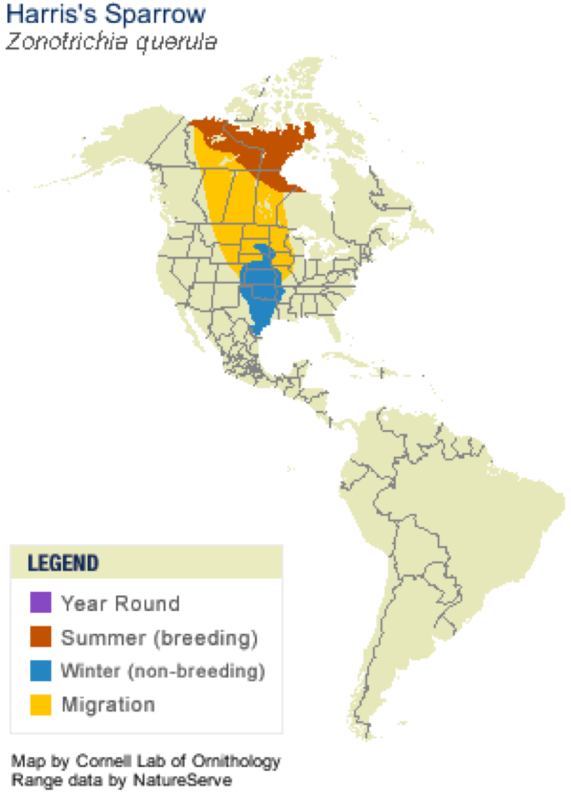 I looked up the distribution range for this bird and the map explains perfectly to me why I am not likely to see this bird in Illinois, even in migration, so I am really thrilled to have gotten such long, loving looks at him and I will remember this bird next time I see it. 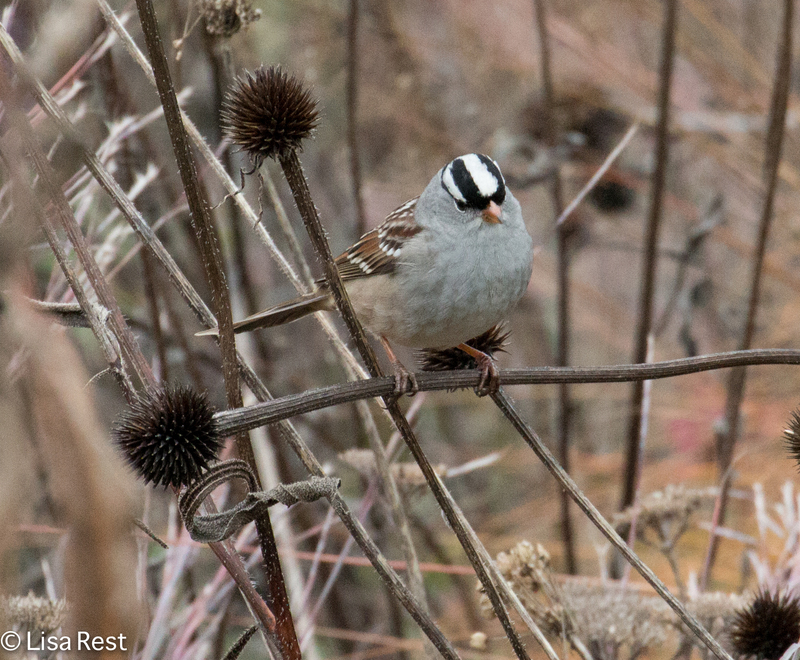 Also at Lurie Garden on Thursday, many more White-Crowned Sparrows than White-Throated, and this time I did not see any Lincoln’s although they could still be about. 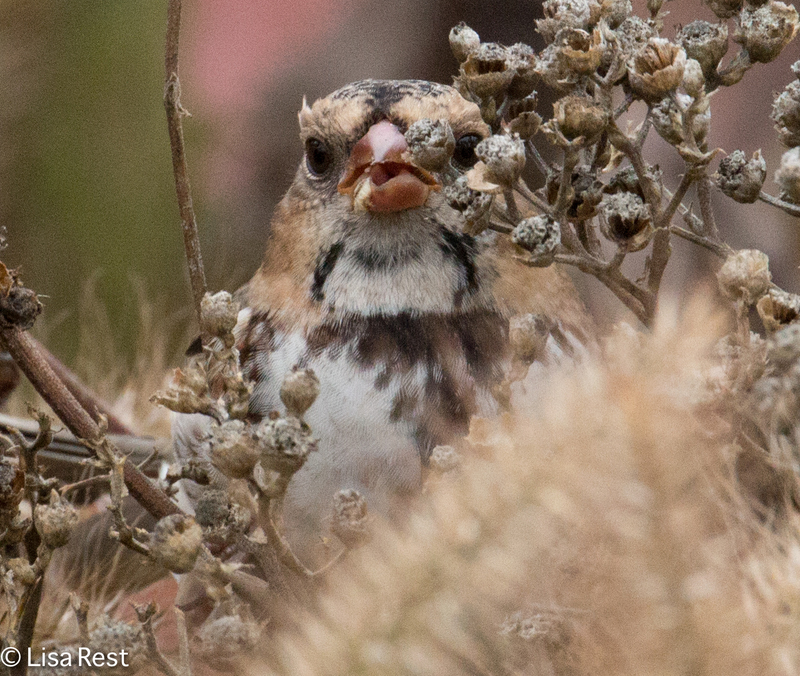 The goldfinches are still having a great time at Lurie, even if the one below looks less enthusiastic about it. 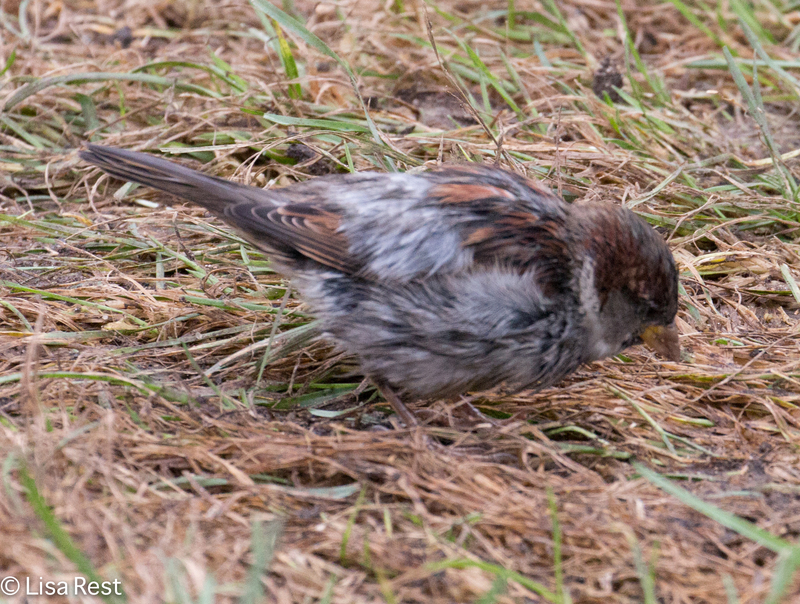 On the Great Lawn close to the entrance to Lurie Garden there were perhaps 100 House Sparrows, and I took photographs of this one whose coloration looked quite different to me. Maybe he was just wet? I decided not to bother the Harris’s again yesterday. Instead I went to Lake Shore East Park to see what was up there. I’ll (try to) be back with a report about yesterday’s discoveries later on. 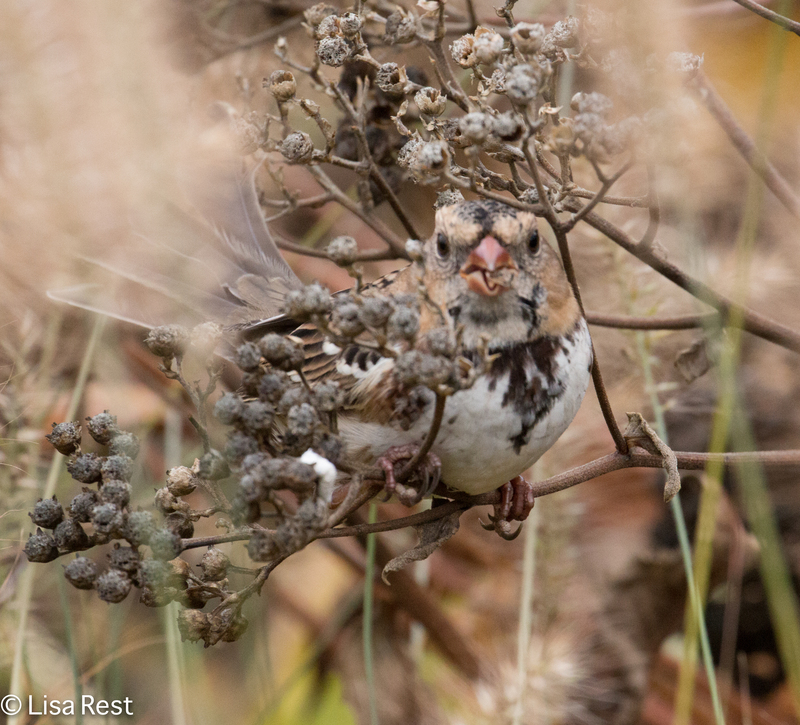 I would not be surprised if the Harris’s Sparrow hangs out a bit longer at Lurie, given the current weather patterns, in which case I might drop in on him again next week. 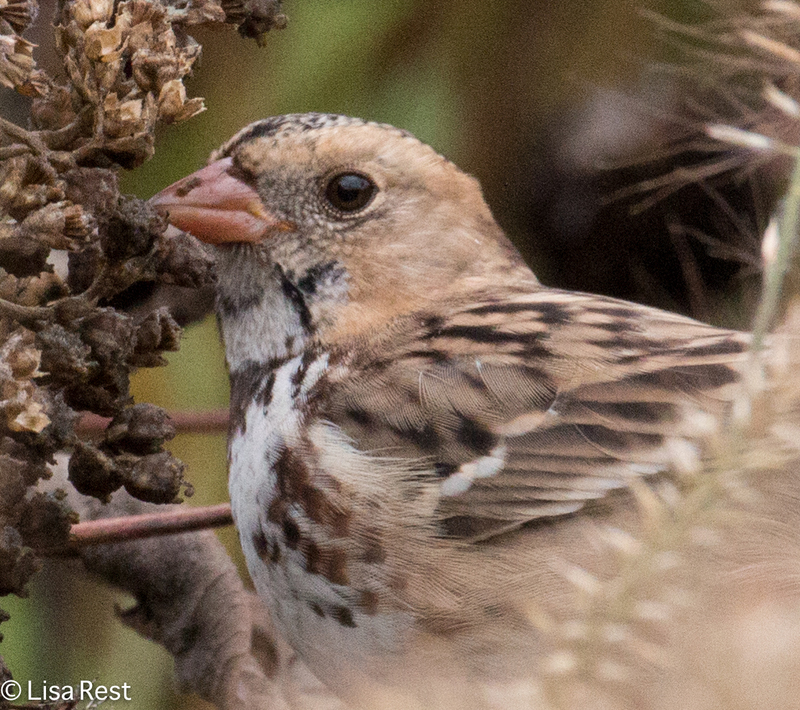 This is a first-year bird, which means I have yet to see an adult Harris’s Sparrow, but it’s still so nice to get such a good, solid lifer in one’s proverbial own backyard. 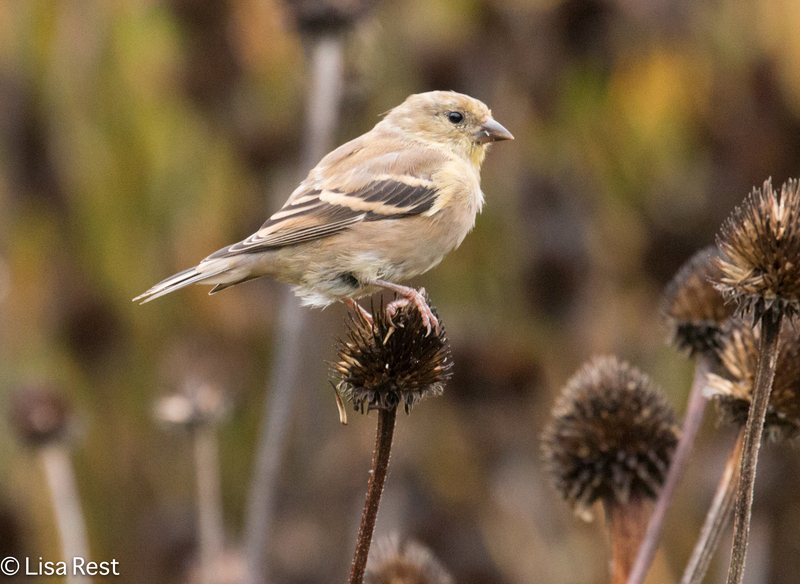 This entry was posted in birding, birds, photography, Sparrows, wildflowers and tagged American Goldfinch, Canon EOS 70D, Chicago Loop, Cloud Gate, Cornell distribution map, fall migration, Harris's Sparrow, House Sparrow, IBET, Illinois wild quinine, Lurie Garden, Millennium Park, White-Crowned Sparrow, White-Throated Sparrow by Lisa Rest. Bookmark the permalink. Congrats!! It’s always a thrill to add a lifer. I love the pics that you got with your “real” camera. By the way, I have ordered the new Canon 7D Mark II. Supposed to be released in November. 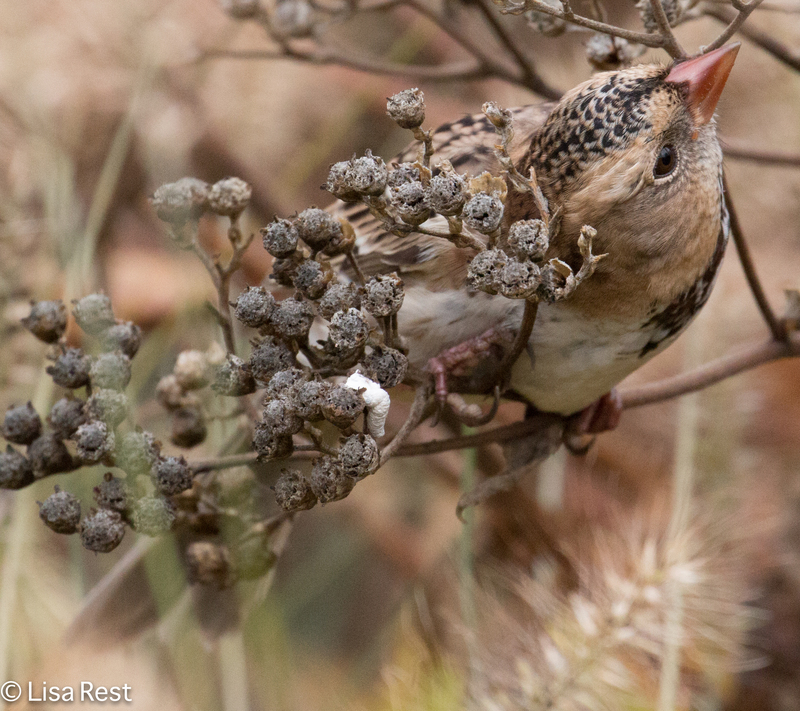 Great pictures of the Harris’s sparrow. I would call it calm rather than tame. Thank you. The bird was unflappable, which made it a lot easier to find both times. 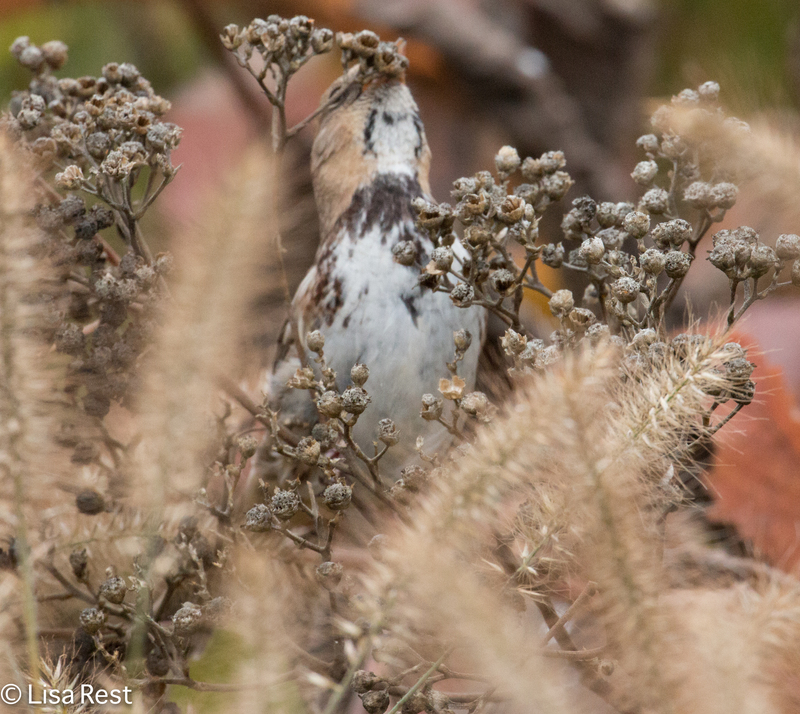 A couple people walked by the second time I had just started to shoot and I winced as the White-Crowned Sparrows scattered in every direction but I looked down and the Harris’s was still there, clinging to its favorite stem. What a delightful bird and your photos are fabulous..love the first one on the post as he just blends into his surroundings.. Congrats on the Lifer…. Congratulations! What an attractive little bird, and such a nice personality too. 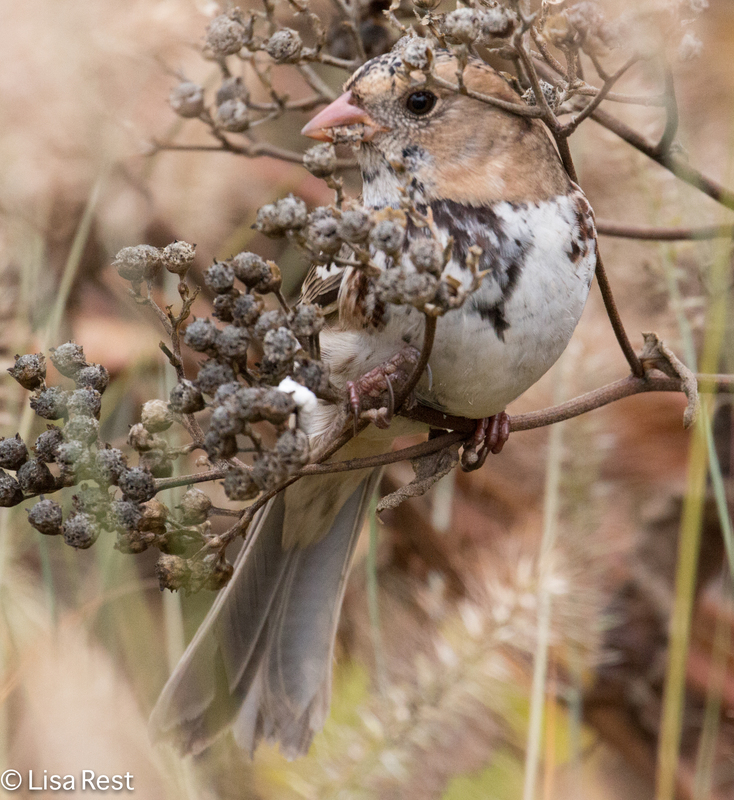 I just spent way too much time looking up Harris’s sparrow and wild quinine, I wouldn’t mind either of them showing up in my backyard but I think I’ll have better luck with the quinine. He really seems to like it which is good enough reason for me to plant it! Thanks, Frank! My sentiments exactly – about the Wild Quinine. Which is something I’ve ignored in the wild for years as a bit boring. 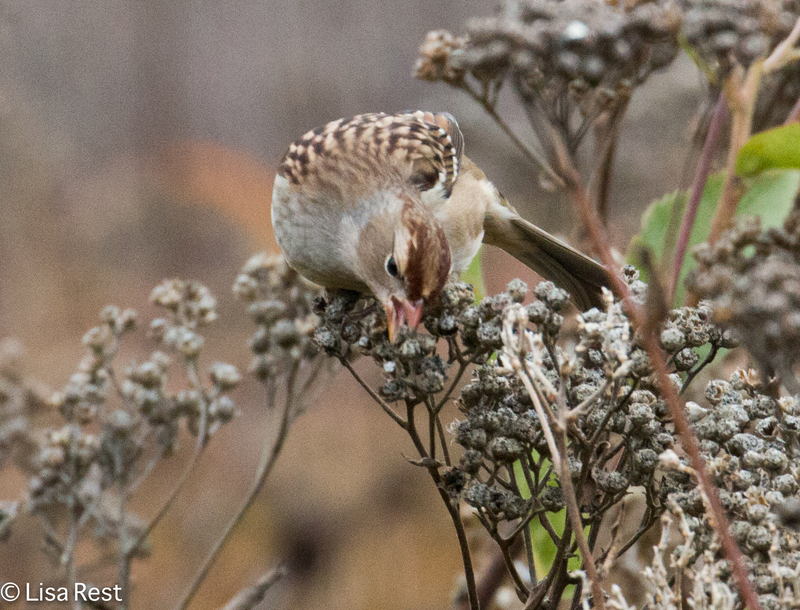 But in the fall it looks like a bountiful feast, at least for this bird and the White-Crowned Sparrows. I hope you get a Harris’s – would be rare for you too!